"Ababil" redirects here. For the race of birds in Islam mythology, see Ababil (mythology). The Ababil (Persian: ابابیل‎‎, "swallow") is an Iranian-made UAV. Iran has developed a number of variants, including the tactical Ababil-5 for medium-range reconnaissance and surveillance, the Ababil-T for short/medium-range attack, and also the Ababil-B and -S.
The Ababil is much smaller than manned airplanes. The length of 2.9 metres (9.5 ft) is shorter than a (true) Volkswagen Beetle. It is powered by a simple two-bladed pusher propeller with a rear mounted wing and a front canard for good stall, stability and maneuverability characteristics. It can be launched from a rail mounted on the back of a truck which provides power for the pneumatic launcher. A rocket launch system can be used from a ship deck, and can be assembled or broken down for portability. A parachute recovery system provides a descent rate of 4 m/s, while skids can be used for conventional landings on a runway or field. It has a maximum operational radius of 150 km (93 mi) and a maximum ceiling of 14,000 ft (4,268 m). It has the ability to travel at a maximum speed of 300 km/h (186 mph) and is capable of carrying a 45 kg (88 lb.) payload. It has a surveillance configuration, carrying a camera and digital communications equipment, but also an attack configuration, carrying a high-explosive warhead that would be delivered by the UAV crashing onto a target. 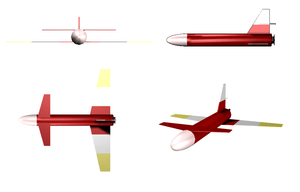 The Ababil-3 can fly up to 200 km/h (120 mph) out to 100 km (62 mi) with a service ceiling of 5,000 m (16,000 ft). It has an endurance of 4 hours and has night vision capabilities. Israel has said that Hezbollah received at least 12 Ababils before the 2006 Lebanon War, and launched three into Israel during the conflict, though all three were shot down by Israeli jets before inflicting damage. On March 16, 2009 it was reported that an American F-16 operating in Iraq shot down an Iranian Ababil 3 drone on February 25, 2009 that had been flying through Iraqi airspace for "almost an hour and 10 minutes." The drone crashed about 60 miles northeast of Baghdad, 12 miles inside Iraqi territory near the town of Balad Ruz in Diyala province. Officials at Iraq's Defense and Interior ministries suggested that the drone might have been scouting for routes to smuggle Iranian weapons into the country. The New York Times, however, speculated that the drone was monitoring Iranian dissidents in Iraq, such as those at Camp Ashraf, which is located near where the drone crashed. However, Maj. Gen Abdul Aziz Mohammed Jassim, head of military operations at the Iraqi defense ministry stated that since the drone, "crossed 10km into Iraq, it's most likely that its entrance was a mistake." The Ababil has also been reported to be in service in Sudan. On March 18, 2012 Sudanese rebels claimed to have downed a government operated Ababil using ground fire. The Sudanese government admitted that a UAV had been lost, though it claimed the crash was due to mechanical failure and not ground fire. On 14 December Hamas militants launched an unmanned air vehicle to fly over a parade in Gaza marking the 27th anniversary of the organization's establishment. Israeli sources subsequently identified the aircraft as an Iranian-made Ababil. ↑ "U.S. Widens Iran Sanctions As Drone Is Reported in Darfur - The New York Sun". Nysun.com. 2008-09-11. Retrieved 2013-09-03. ↑ Ben-David, Alon. "Israel shoots down Hizbullah UAV", Jane's Defence Weekly. Retrieved on September 14, 2006. ↑ Ephron, Dan. "Hizbullah's Worrisome Weapon." Newsweek September 11, 2006: p. 28. ↑ "Iranian drone 'shot down in Iraq'". BBC News. 16 March 2009. Retrieved 16 March 2009. ↑ Shadid, Anthony, "U.S. Downed Iranian Drone Over Iraq", Washington Post, p. 9. ↑ Nordland, Rod, and Alissa J. Rubin, "U.S. Says It Shot Down An Iranian Drone Over Iraq", New York Times, March 17, 2009. ↑ "Iranian drone 'shot down in Iraq'". BBC News. March 16, 2009. Retrieved April 23, 2010. ↑ "Strategy Page". Retrieved 9 April 2012. ↑ "Israel scrambles fighters as Hamas parades Ababil UAV". Wikimedia Commons has media related to Ababil.